The year 2000 was a dark time for me. I wore mostly black. I was grossly overweight and unhappy. I was drinking so much that it was affecting my company and my family life. I felt lost and alone. A few years prior to that I was cut off from my family of origin. Coming from a large tight knit family, being cut off was unheard of. Without the support I thought I would have as I grappled with memories and issues of my past, I went into a deep, dark and scary place full of nightmares at night and despair and depression in the day. I worked hard to put on a happy face and continue on as if nothing had happened. I would stop at grocery stores and park in a far away corner to cry in an effort to keep it together when my kids got home from school. (I didn’t keep it together as well as I thought.) I was in therapy but I refused to go on any antidepressants (not a great idea in hindsight). I had no way of sharing with friends what was going on. How do you tell people that your family is suddenly gone? It wasn’t like anyone died. This behavior eventually lead to me sitting in my car as it was running in our closed garage at 8:00 on a Monday morning. My grown son, who was home that day (and normally slept late on his days off) woke up, and, as he told me, was moved to go to the garage. “Mom?? ?” I remember it so well. I didn’t want him to see me that way and I didn’t want to try any longer pretending that I was OK.
That was the first miracle that saved my life and my long journey of healing began. Not long after, a few women I didn’t know; angels, as I refer to them now, picked me up and took me to breakfast on a Saturday morning. It was the first Saturday in years that I could get up at the crack of dawn and face the day. I’ll never forget sitting in that diner, drinking coffee with them. I was confused. Why would they want to spend time with ME? I was ugly. I was sad. My brothers, sisters and parents didn’t want to be with me, so how could anyone else? Those same women invited me a few months later to attend an art opening that was featuring a painting one of them did. She was not an artist but she told me she painted a “mandala”. I had never heard of mandalas, but I agreed to go. I was curious – how could she be in an art show at a gallery without any artistic experience? I remember vividly walking into the Jung House in Columbus, Ohio. There were framed mandala paintings hanging on the walls. There were dozens of mandala cookies at the reception table. I walked around and looked at each painting closely. I read each of the artists statements. These women wrote that painting a mandala had opened them up to new possibilities, new awarenesses and healing hidden wounds. The paintings were stunning and each one spoke to me in a different way. These were all women who had never painted before. I felt my grief subside. I didn’t realize that was happening at the time but as I look back, it was a turning point that allowed me to heal and to grieve. A small crack was made in my armor of despair, sadness, fear and confusion. I walked over to the table full of mandala cookies and the woman who curated the show, Merry Norris of Merry Nova Studio was behind the table. She had a beautiful smile and sparkling eyes. She was stunning. 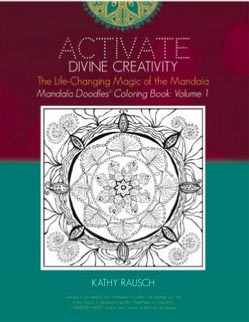 My divine creativity was activated and my journey with the mandala began. 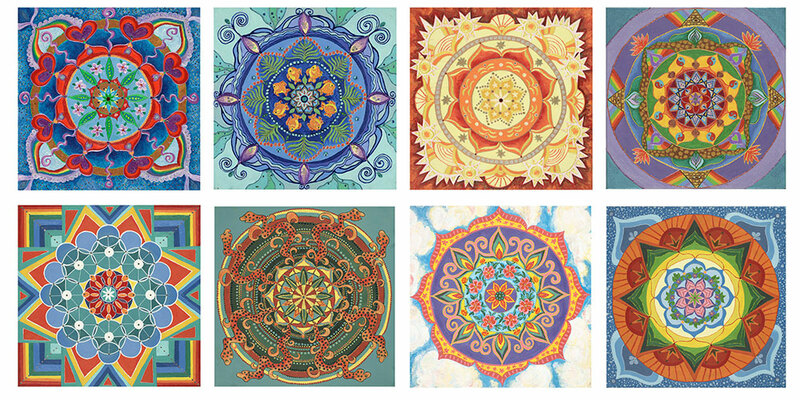 My first mandala workshop with Merry and several other women began a few weeks later in the gorgeous studio in her home. Merry welcomed us like family. Her husband John, made us coffee, said hello and left us as we began the evening kick off. The combination of a powerful woman with a supportive husband was and continued to be profound. No artistic experience was necessary to attend the workshop and each woman came with an intention, something they wanted the painting to represent in their life. 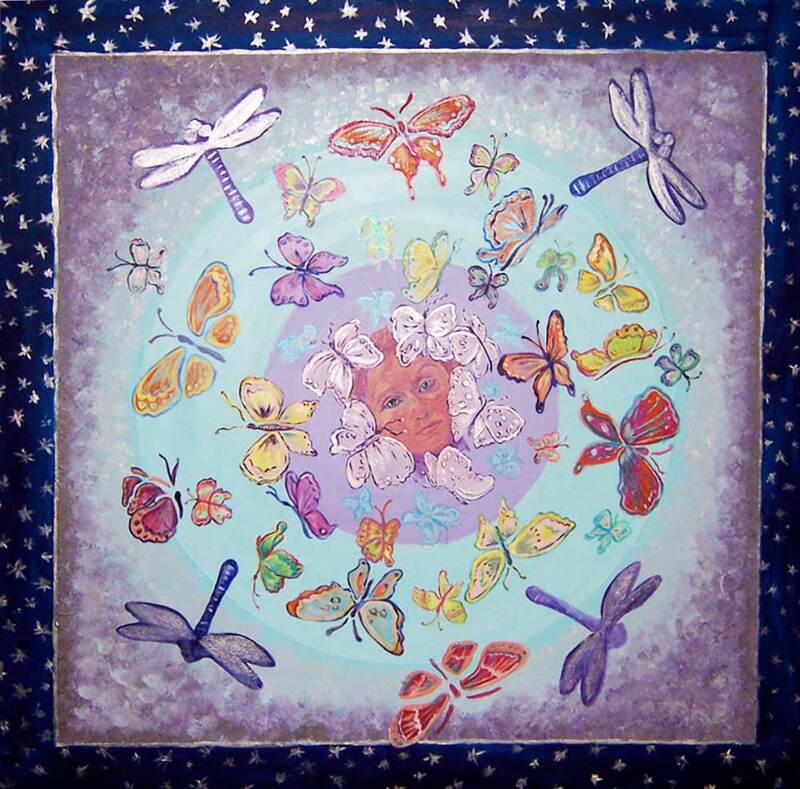 My intention was to paint a mandala that honored my family of origin. Over the next 4 days I cried and laughed and grieved. And I painted. I painted for the first time in many years. 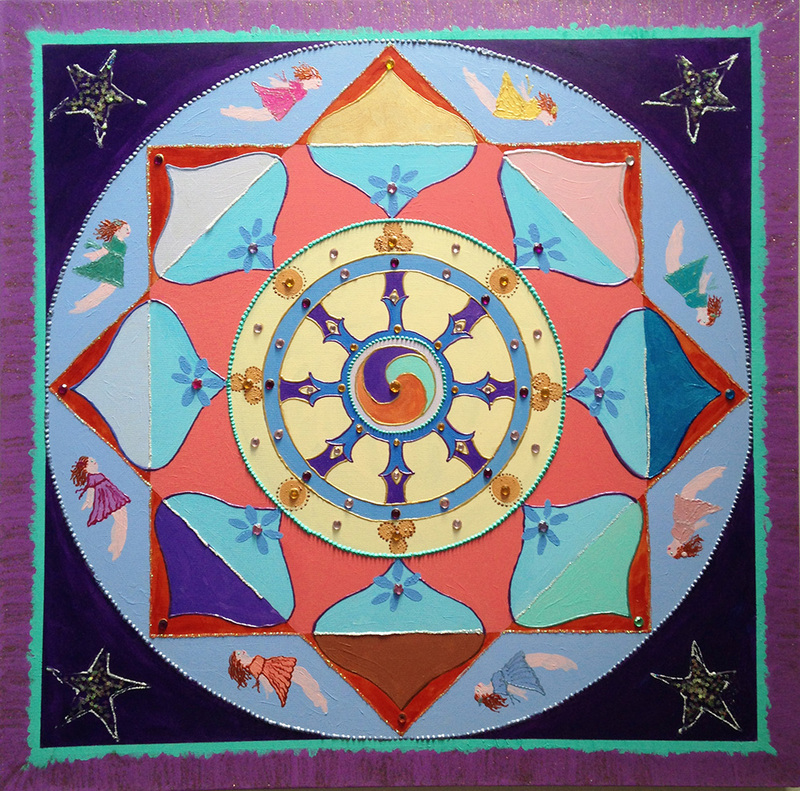 I learned that the Dharma Wheel is a symbol of strength and Merry helped me decide to put one surrounding the center of my painting which represents the swirling mass of energy that became me. At the end of the workshop, each of us took turns expressing what our painting meant to us. I could feel the healing begin. I talked about why I loved each and every member of my family and I cried. I cried from the deep dark places of my soul. But, as the “dark night of the soul” goes, I was not done. I was just beginning the long journey of walking through the corridor of my demons. As I think about it now, I see that there were rays of sunshine peaking through the darkness, angels tapping me on the shoulder and divine guides gently pulling me along the way. My husband and two grown sons were a constant lifeline of support. They were happy to see my old self again. They were thrilled to see me being creative, smiling and laughing. Being creative allowed the Divine to speak to me even at my darkest moments. Over the next few years I had to grab the life ring and hold onto it, as I was in a battle with the strong waves of a deep, dark depression and the despair of grief that pulled me under again and again. I continued to create and express what was going on inside as often as I could in painting and drawing workshops and in my journals. 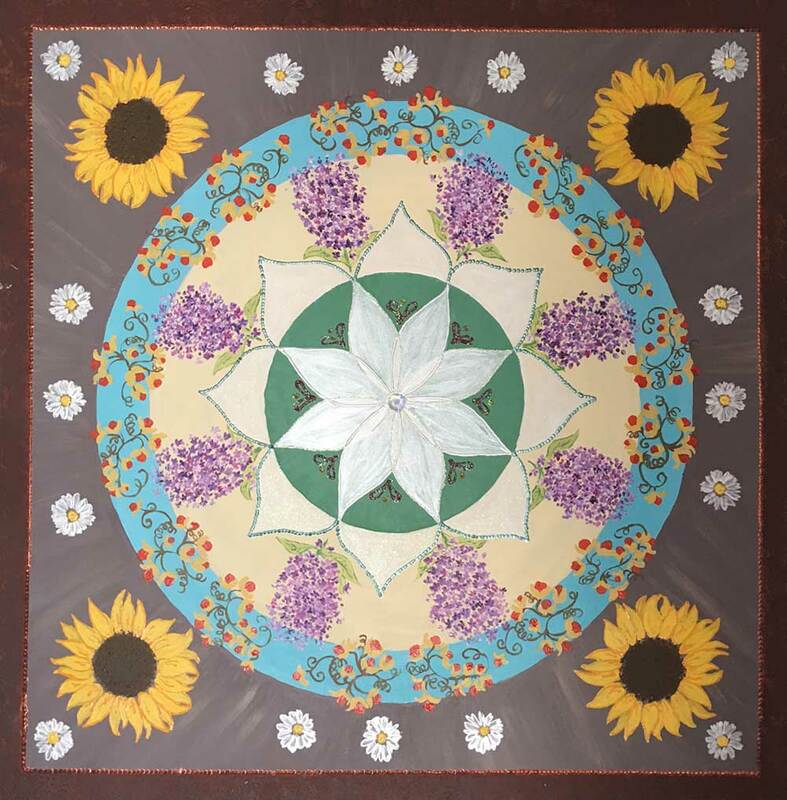 I painted a mandala in honor of the time I spent with my mother picking her favorite flowers. I painted a self portrait mandala. I painted a mandala to express the true nature of who I am from A-Z. 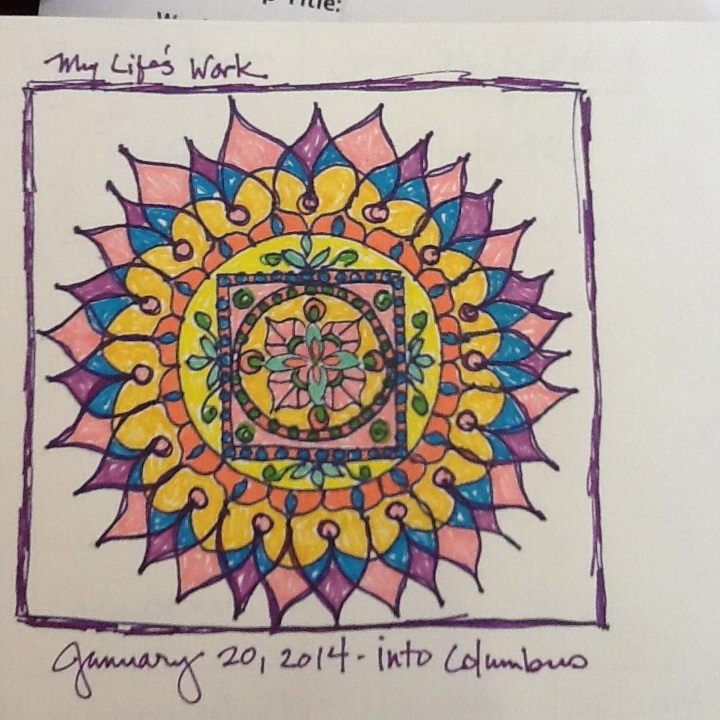 I drew a mandala at a workshop with Merry’s mentor, Paul Haussestaum with the intention of expressing joy. 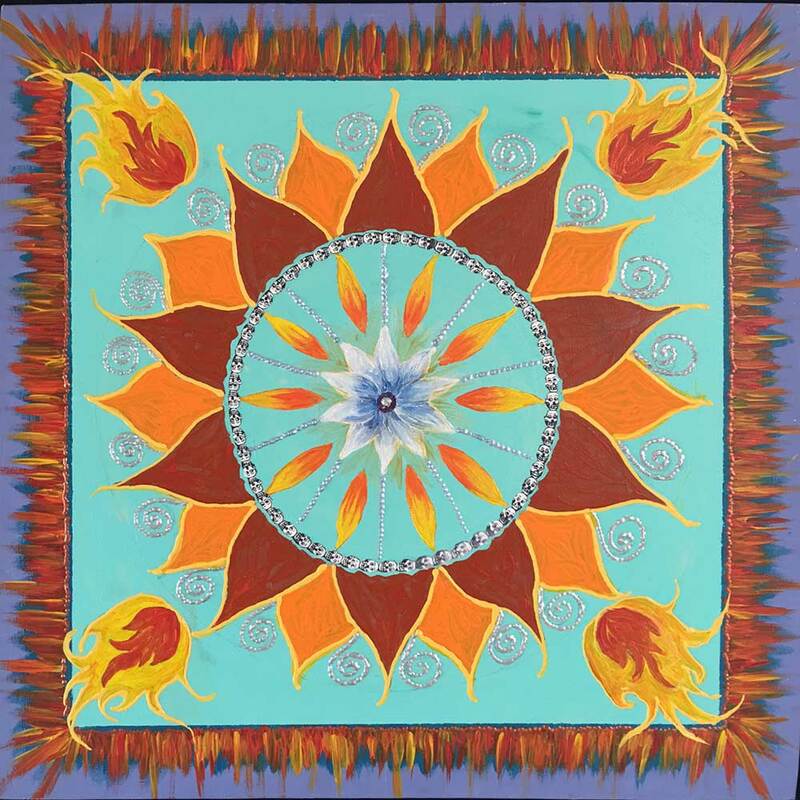 I painted a mandala burning away the past and welcoming in the new. Merry and I spent a week in Maui painting. I did a painting to express my love of Maui (but it truly represents my love for Merry, who is my closest and dearest friend). Soon after our trip to Maui, I was at the Jung House again, meeting Merry for an art opening. I accidentally sat down in a lecture as I thought Merry was going to be in that room. The lecture had started so I stayed the duration. The speaker talked about our individual divinity. He said that each and every one of us is a divine human being. “Divine?” “Me?” I was dumbfounded as I thought about it. It occurred to me that we were in the same room where the original mandala painting exhibit was several years earlier. 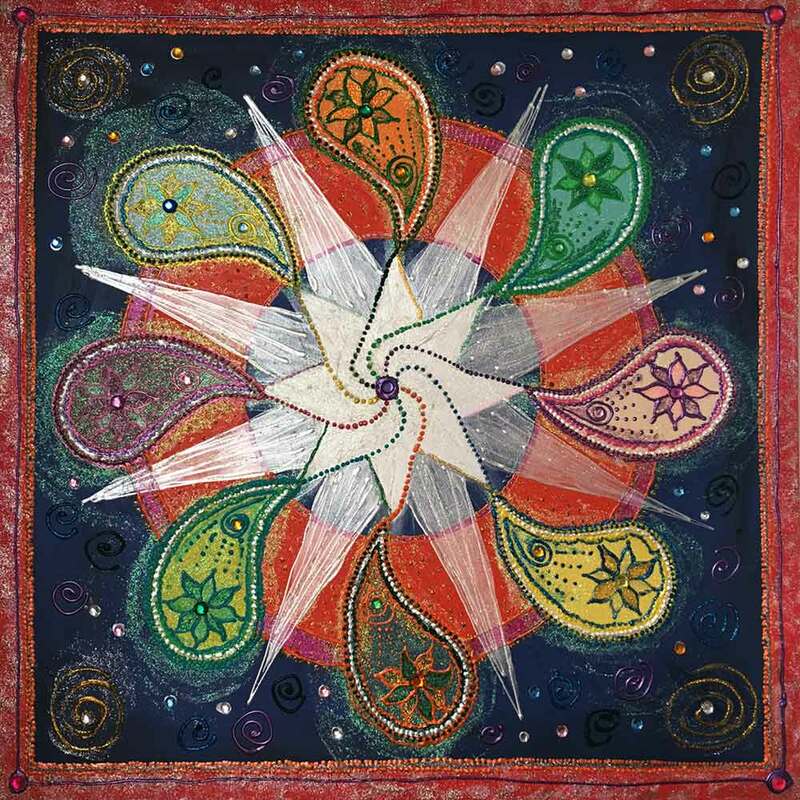 I was also struck that it was “the Jung House” as by then I knew that Jung used mandalas often in his work with patients and in his own journals. 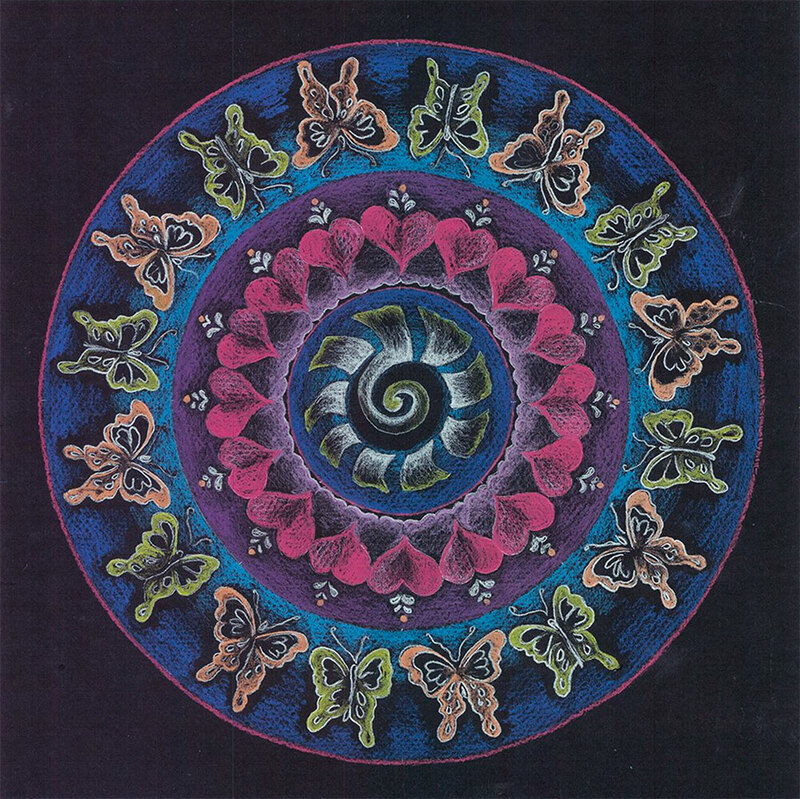 C. J. Jung encouraged his patients to create and study mandalas as he believed that a mandala holds space for your psyche. He believed that creating and studying them gently heals issues we aren’t even aware of. I became obsessed with doodling and creating mandalas. I incorporated mandalas in all of my journals. I painted them, I drew them, I even needlepointed mandalas. 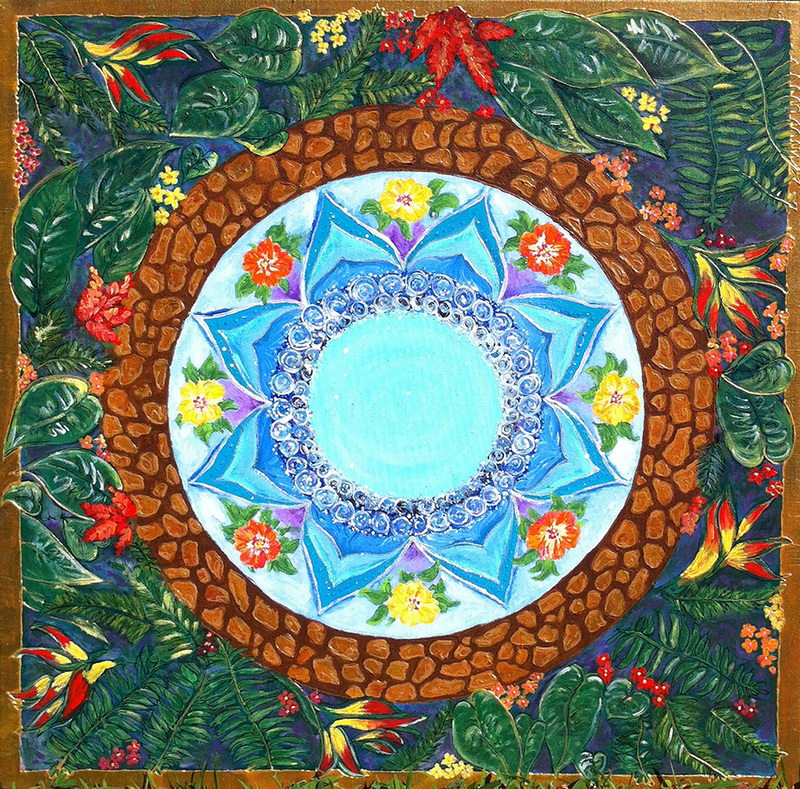 I created a mandala ceramic backsplash for a friend of mine on commission. You see, in the beginning of each class, I would draw a dot on a page and then doodle and color a full blown mandala as I absorbed the information. “Hmmm.. I should teach people who to doodle mandalas.” I thought. 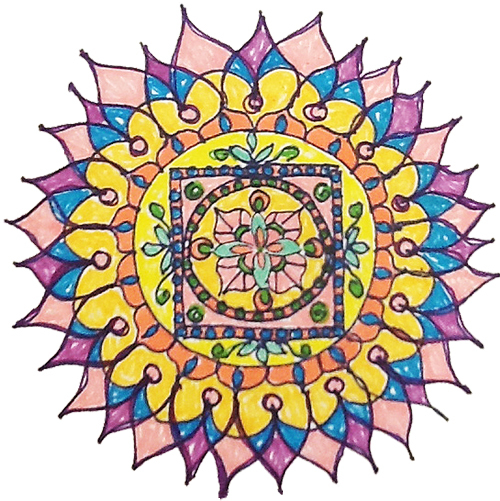 Painting a mandala is wonderful, but doodling is less scary to most of the population who thinks they are “not creative”, and can be done anywhere! By then (in the year 2013), the divine power of creativity was apparent to me. When I am creating a mandala, my “monkey mind” stops. I don’t have any thoughts crowding my mind as I let a mandala unfold. It doesn’t matter if I’m painting one, doodling one or needle pointing one. I have learned what it means to be mindful through the process of being creative. 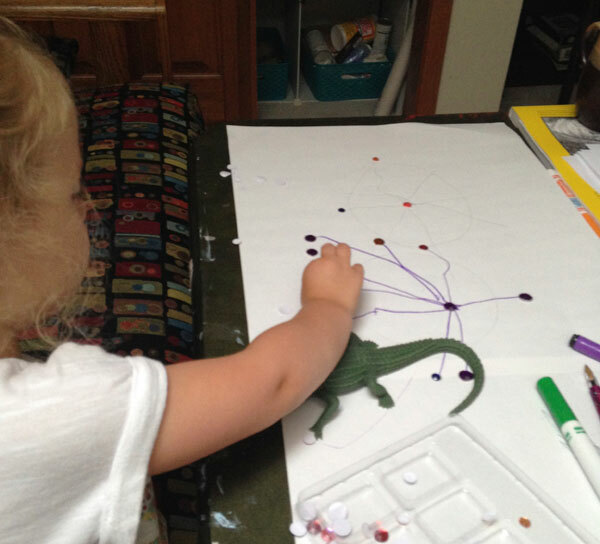 One day, I was drawing a mandala while I was with my granddaughter. She asked me what I was doing. I told her it was a mandala. “I want to draw one myself!! she said. Within 15 minutes Ruby created her first mandala. “Wow,” I thought. It’s just so easy!” What an affirmation. In 2015, while reading Marianne Williamson’s book “The Law of Divine Compensation”, the idea to write a book popped into my head. And there you have it. That year, I wrote a book and did the keynote speech just as the books were hot off the press. She bought 100 books, one for each attendee. I have no doubt that allowing myself to be creative, to stop everything that’s going on around me other than putting my mind and my hands to work doing something creative is a powerful force of meditation and mindfulness. Being creatively mindful has allowed old thoughts of grief, shame,fear and confusion to melt away. I can be alone with myself and engage in thoughts of gratitude and love. I am forever grateful to those who helped and loved me through my dark night of the soul and for the gift of expressing my creativity again. Our world needs more creativity, don’t you agree? 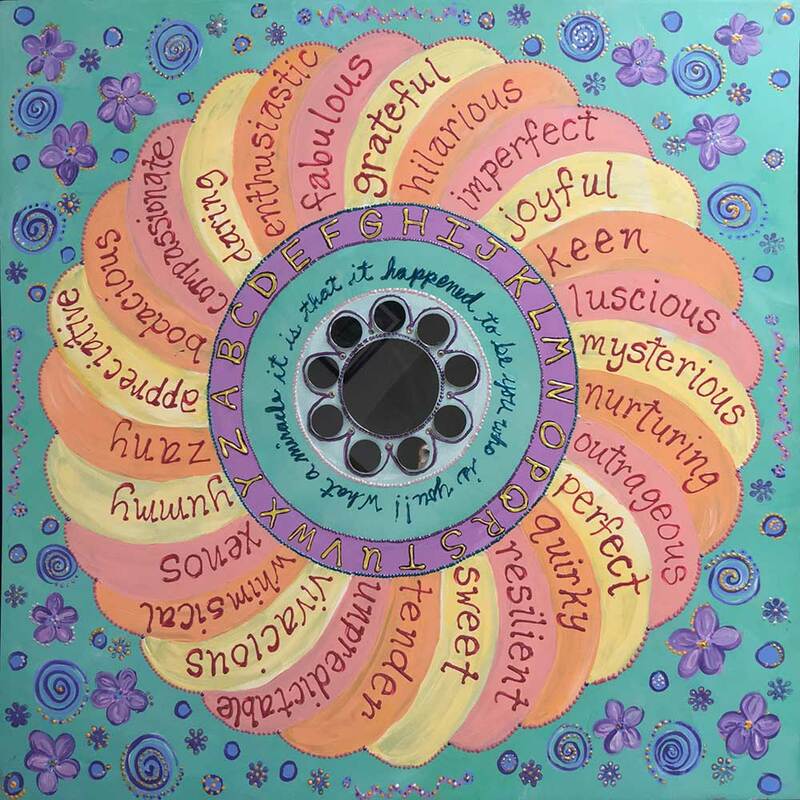 Wow Awesome Kathy, what an incredible strong story!Its amazing what comes from a mandala! and Saying yes! Paint on and Stay FRee! and happy! Oh Lauren – thanks so much for commenting! A fellow mandala lover and artist! Woo Hoo! Thanks Ayo – please share with me as your creativity is set freeee! What a story you have to tell. I never knew. Congratulations to you for finding your way. And through your process of healing, you’ve created beautiful pieces of art.